May I read all of those in 1 month!!! Yesterday, I have to go to buy those books at their office. 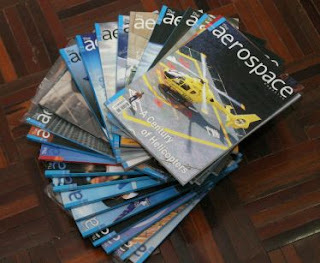 Those are 23 issues of aerospace magazine, I think they're rare books, because I couldn't find it easy as other book such as semiconductor electronics or even as shutter photography. I like advance technologies such as computer, electronics including aviation. I will try to read all of those in 1 month, if I can.